The U.S. Navy was officially founded as the Continental Navy 240 years ago, on October 13, 1775, during the American Revolutionary War. Since its inception, the U.S. Navy has been involved in the Atlantic Ocean. Later on, its operations spread to the Pacific as the United States expanded. However, a topic that has interested me lately is the history of the U.S. Navy in the Indian Ocean, which is not as well known as its exploits in the Atlantic or Pacific oceans. This is despite the recent heavy American military involvement in areas of the Middle East and South Asia near or on the Indian Ocean littoral. As noted by Robert Kaplan and many others, the Indian Ocean littoral is pivotal to the 21st century. This is but the re-emergence of a previous pattern that lasted until European colonialism, where the main corridor of world trade routes passed through the Indian Ocean. Today too, many global trade and energy routes pass through the Indian Ocean, and go either to some place along the littoral or on to Eastern Asia. 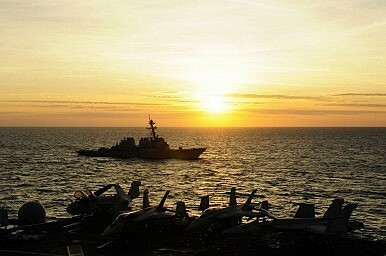 Some of the contemporary world’s bloodiest conflicts are near this littoral, necessitating an American naval presence. Yet despite this fact, the Indian Ocean is part of the operating areas of three separate U.S. fleets. Two of these, the 6th and 7th also operate in the Atlantic and Pacific oceans respectively; only the 5th, based in Bahrain, whose area of operations encompasses the southern coast of the Middle East, Pakistan, and the Horn of Africa, is a fully Indian Ocean fleet. This is the legacy of a navy that has historically been oriented toward the United States’ own shores. Through the 19th and first part of the 20th century, the Indian Ocean was essentially a British lake. Not only did the British control India, they controlled the various choke-points around the ocean to secure the sea lanes to their most valuable colony: the Suez Canal, the Strait of Aden (Bab-al-Mandab), the Strait of Hormuz, and the Strait of Malacca. American naval presence in or near the ocean was minimal, despite the acquisition of the Philippines in 1898 and increased involvement in the western Pacific. During World War I, the United States did not even declare war on the Ottoman Empire. The U.S. did not even have ambassadorial relations with Iran until 1944, after the 1943 Tehran Conference during World War II. American involvement in the Indian Ocean grew substantially during and after the Second World War. Eventually the United States became the main guarantor of safety on the high seas in the Indian Ocean, especially after the British withdrawal from “east of Suez” in 1971. During World War II, hundreds of American advisers were stationed in India. More importantly for the future of the region, President Franklin Delano Roosevelt stopped in the Suez Canal on his way back from the Yalta Conference in February 1945. There, he famously met the founder of Saudi Arabia, King Abdulaziz ibn Saud on a ship. The king had several sheep brought on board the ship, slaughtered, and roasted for the American crew while security for oil guarantees were discussed by the relevant parties. Consequently, in 1948, a U.S. naval presence was established in the Persian Gulf, which soon became the Middle East Force in 1949. This leased a part of the former British base in Bahrain in 1971. On the other side of the Indian Ocean, the U.S. naval presence was smaller. In one notable instance during the Indo-Pakistani War of 1971, the United States sent U.S. Task Force 74 west from the Pacific Ocean to monitor the war and possibly as a show of support for Pakistan. In the last 50 years, the American naval presence in the Indian Ocean began to grow in size from its beginnings in 1940s, though it has for the most part remained in the Arabian Sea portion of the Indian Ocean (the area covered by the 5th Fleet today). There are two important milestones in this process. The first was the establishment of a 50-year American lease on the British Island of Diego Garcia in the southern Indian Ocean, starting in 1966. The island has since been inhabited by around 5,000 British and American soldiers (the native population was deported during this process) and was a staging ground for the American wars in Afghanistan and Iraq. The other major milestone of the American naval presence in the ocean was the Persian Gulf War. The 7th Fleet, based in the Pacific, was mainly responsible for naval operations during this war. To signify increased U.S. commitment to the Middle East, the region got its own fleet–the reactivated 5th Fleet–in 1995, based in Bahrain. This is of course, been heavily involved in all subsequent operations in the region since. Today, it is hard to imagine an Indian Ocean–especially the Arabian Sea littoral–without a U.S. naval presence, but the American presence in the Indian Ocean is not nearly as old or as deep as its presences in the Atlantic and Pacific Oceans, which actually bound the United States. The U.S. naval presence in the Indian Ocean is thus dependent on the goodwill of allies, though there is no doubt this goodwill will persist far into the future. As the Indian Ocean and the lands surrounding it grow in importance, expect it to become ever more important to the U.S. navy as it celebrates its birthday.